Dimensionless numbers are of very high importance in Mechanical Engineering and Chemical Engineering including Thermodynamics, Fluid Mechanics, Mass Transfer, Heat Transfer, Solid Mechanics, Momentum Transfer and Chemical Reaction Engineering. Many of these dimensionless numbers are common in all these subjects, we will mainly focus on them, they are of great importance in engineering exams. We will describe major dimensionless numbers one by one below, symbol, formula and significance, but first you should know about the nomenclature used. Re is the ratio of Inertial forces to the Viscous forces. Primarily used to analyze different flow regimes i.e Laminar, Turbulent, or Transient Flow. When Viscous forces are dominant (i.e low value of Re) it is a laminar flow. When Inertial forces are dominant (i.e high value of Re) it is a Turbulent flow. Depends only on fluid & its properties. It is the ratio of momentum diffusivity to heat diffusivity of the fluid. It is also the ratio of velocity boundary layer to thermal boundary layer. Pr = small, implies that rate of thermal diffusion (heat) is more than the rate of momentum diffusion (velocity). Also the thickness of thermal boundary layer is much larger than the velocity boundary layer. Analogous to Prandtl number of Heat Transfer. Used in fluid flows in which there is simultaneous momentum & mass diffusion. It is also the ratio of fluid boundary layer to mass transfer boundary layer thickness. To find mass transfer coefficient using Sherwood number, we need Schmidt number. Ratio of thermal diffusivity to mass diffusivity. Fluid flow with simultaneous Heat & mass transfer by convection. It is also ratio of Schmidt number to Prandtl number. Ration of Heat transported by convection to Heat transported by conduction. Product of Re & Pr for Pe(HT) & product of Re & Sc for Pe(MT). For HT, It is the ratio of heat transferred to the fluid to the heat capacity of the fluid. For HT, It’s the ratio of Nusselt Number to Peclet Number i.e St(HT) = Nu/(Re.Pr). Used to find heat transfer in forced convection flows. For MT, It’s the ratio of Sherwood Number to Peclet Number i.e St(MT) = Sh/(Re.Sc). Ratio of Convective to diffusive mass transport. Analogous of Nusselt number in Heat transfer OR Sherwood number is Nusselt number for mass transfer. Ratio of convective to conductive heat transfer coefficient across the boundary layer. High Nu => convection is more => Turbulent flow. It can also be viewed as conduction resistance to convection resistance of the material. Ratio of Buoyancy force to viscous force in natural convection. Reynolds number is used in forced convection of fluid flow, whereas Grashof number is used in natural convection. Used in unsteady state (transient) heat transfer conditions. Ratio of heat transfer resistance inside the body to heat transfer resistance at the surface of the body. OR ratio of internal thermal resistance to external thermal resistance . Shows the variation of temperature inside the body w.r.t to time. Bi < 0.1 => heat transfer resistance inside the body is very low => inside the body conduction takes place faster compared to convection at the surface. => no temperature gradient inside the body (uniformity in temperature) vice versa implies that Temperature is not uniform throughout hte material volume. It shows the presence & strength of convection in a fluid body. Characterizes laminar flow in a conduit OR transfer of heat by streamline fluid flow in a pipe. In case of mass transfer, Pr is replaced by Sc. Ratio of rate of heat conduction to the rate of heat storage. Used along with Biot number to solve transient state heat transfer problems. For mass transfer by diffusion, Fourier number for MT is used. It can also be understood as current time to the time taken to reach steady state. First seven number are very important and must be known by every chemical engineer in detail as they can be asked in any test/exam of their field. 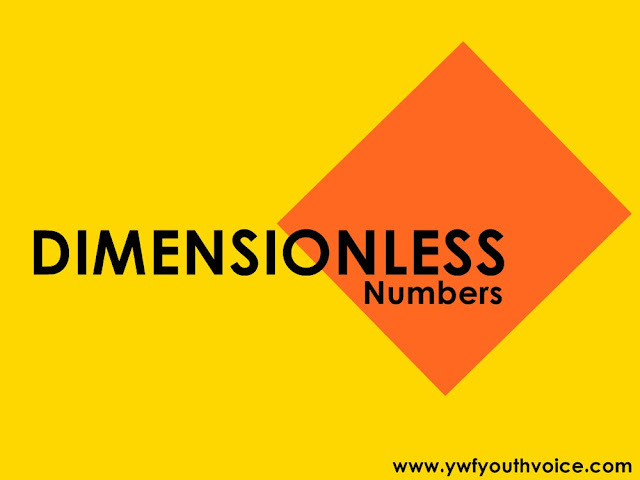 List of dimensionless numbers is quite long, if you want us to include some more in this list then let us know via comments.